“Oh the weather outside is frightful” We all know how cold it can get. So many people are out in the cold and appreciate some items to help them stay warm. 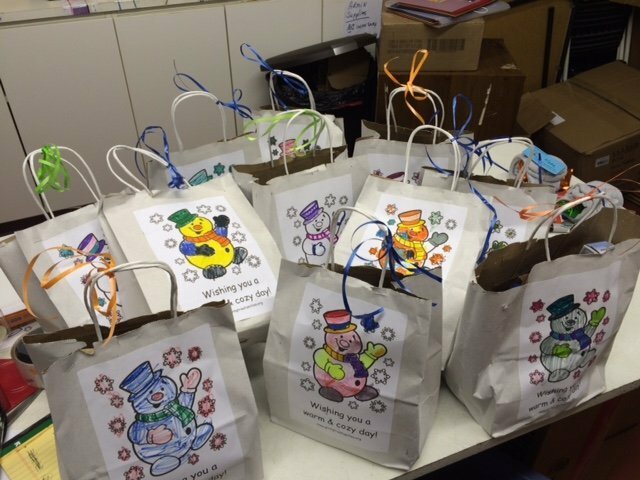 Our snowman bag that is decorated by the kids is filled with some warm weather items including a hat, scarf and a pair of gloves. In addition, there also includes a tube of toothpaste and a toothbrush. Personal care items are so important to those individuals visiting shelters and homeless outreach centers. Consider building a snowman party of your very own! !